An experimental guinea pig lying on a lab table. 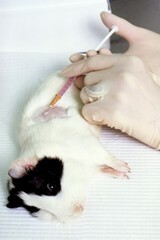 Also seen are the hands of a female technician injecting a substance into the animal. The fur around the area being injected has been shaved away, exposing the area to be injected.